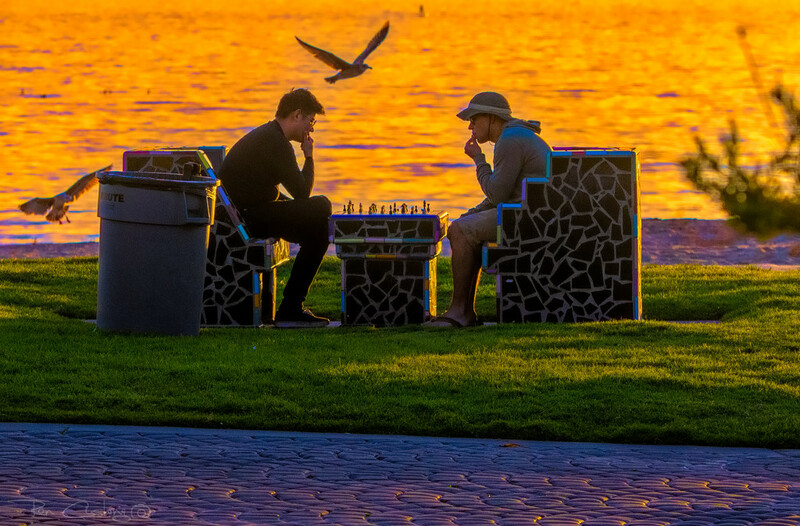 What better way to enjoy a sunset than by squaring off in a chess match? i'm wary of those damn birds. if they come that close to me, i need a big umbrella. :-D nice colours but damn! couldn't they have placed the trash bin elsewhere! This is amazing as a composition -- vivid colors and golden tones in the water, along with the bird going by. They are totally locked into the game and don't even notice. Seagull to Queen 3. Great image Ron. What a fabulous image Ron! You get such wonderful sunsets! I love the seagull watching the Game! Could the seagulls and sunlight have been any more perfect? This is fabulous. The birds add a nice touch of action.